Pumpkin Spice – Not Just for Coffee Anymore! Are you crazy for flavored coffee? For some, the flavors and styles of their premium coffee mark holidays and the change of seasons. For instance, if you are like a lot of people, it’s not really fall until you can have a hot cup of New England Coffee’s Pumpkin Spice Flavored Coffee. There’s just something about those warm spices combined with the rich premium coffee that makes you think of red and gold leaves, sweaters, boots and football games. As soon as Pumpkin Spice items return to menus and store shelves, it seems like social media lights up with posts about it. Pumpkin pie has always been a part of our fall experience, but did you ever wonder when the tradition started? Pumpkin has been a signal of fall in North America for a long time; archeologists found pumpkin seeds in Mexico dating back to approximately 7000 B.C. Pumpkins are native to our continent, but were introduced to Europe in the 16th century, where the squash quickly became popular. The oldest pumpkin pie recipes date back to the 17th century, and by the 19th century the traditional pumpkin pie spice had evolved. It is usually a combination of cinnamon, ginger, cloves or allspice and nutmeg. In recent years, the flavor of pumpkin pie has been added to everything you can think of – cookies, cakes, butters, soaps, lotions, candles, marshmallows, pudding, candies, liquor, breads, breakfast foods, pasta sauces, even – potato chips? Americans can’t get enough of pumpkin spice, apparently! 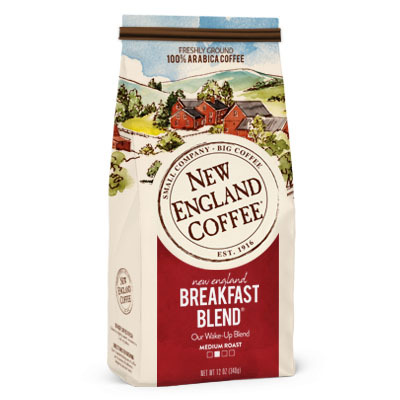 But our favorite is still the warm, comforting cup of New England Coffee’s Pumpkin Spice Flavored Coffee. 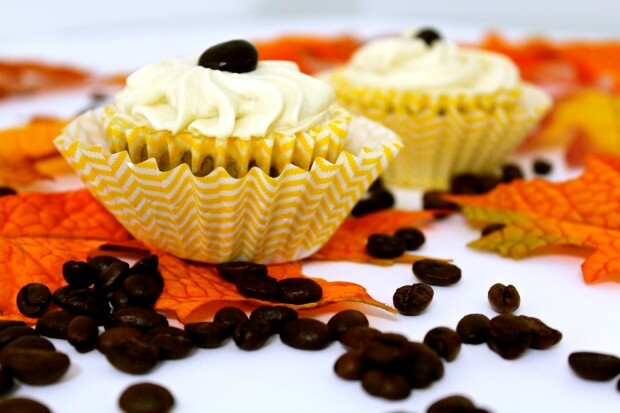 To go with your cup, try this easy recipe, which incorporates New England Coffee’s delicious Pumpkin Spice in a rich cupcake topped with a spicy cream cheese frosting. Here’s a tip: cupcakes will always be moist if you brush them with hot coffee while they’re still warm out of the oven. Try this on spice, chocolate, French vanilla or carrot cupcakes: Brew some strong New England Coffee while your cupcakes are baking. Once they’ve been out of the oven a few minutes, brush the hot coffee over the cupcakes, then brush again and allow to cool completely before frosting. Preheat oven to 350 degrees. Place 24 cupcake liners in muffin pans. Place cake mix, oil, eggs, pumpkin and 1 cup of the coffee into a large bowl. Blend with an electric mixer at low speed until moistened, then beat at medium speed for two minutes. Fill liners two-thirds full. Bake for 18 minutes and test for doneness with a toothpick. Cupcakes are done when the toothpick comes out with just a few moist crumbs clinging. Place cupcakes on a wire rack to cool. After cupcakes have cooled for about 10 minutes, use a pastry brush to brush them with the reserved 1/4 cup of coffee. Allow to cool completely before frosting. Place butter and cream cheese in a large bowl. Blend together on low speed until smooth. Add sugar, one cup at a time, until incorporated. Add the spice and the coffee, and blend until smooth. I can’t wait to try these for the holidays!